For Christians, no one seems to notice, but words fail us during this Holy Season. Liturgically, we witness this starting on Good Friday where ritually we become more quiet. This makes sense as we move into a period of grief. Then Holy Saturday arrives and once again liturgically there is nothing to say. Nothing to do. Marking a period outside our control and making us very uncomfortable and nervous. Too often, we quickly jump to thinking or speaking about a joyous Sunday. It is for this very reason, yesterday’s post by me was a “silent one.” Yet here we are on that Sunday and once again our words fail us. I think it is because of this, I came very close to posting a very short and almost silent blog post that is the subject of an almost yearly discussion in my family. I considered posting the words of a brief Easter Sermon. My father reported the message of this sermon once that has become something of a celebrated tradition to reflect on in my family. I am unsure if it is a true sermon, if he happened to actually hear it or if he was reporting something he heard someone else describing. As a permanent deacon for many years now, my father has been present to many liturgical events, has heard many sermons and has been privy to some very interesting conversations with other deacons and priests so it is possible that this is a second or third hand account. Or a false tale all together. Yet, every year as we approach Easter, I think of this story and bring it up again and my father, my brother and I shake our head, chuckle at the nerve of it, and wonder. What could it mean? It is truly my favorite Easter Sermon Moment even though I mention it in some circles and it has raised eyebrows and even caused anger. Another pause. Indicating that he was about to stress a point he did not want missed. He again sweeps their faces gently. Not rushing. He then says, “And you don’t believe it.” Very silent now. Every one’s attention. He looks down, the look on his face — is it sadness? Resignation? He then turns and walks back to the sacristy. It is such a striking and powerful punch line on a day of celebration, I can’t help but wonder about it. Whether it actually happened or not, I think it points in a direction for me personally. What does it mean to say Christ is risen? What would it mean to say I believe that? How do I truly say it. Do I truly believe it? I think the reason I find the sermon so personally powerful is that it was given at Church. This isn’t a rant in some location where belief is being questioned. It is given to those who took time out to mark the resurrection. I also think it is powerful because it is true. I don’t believe it — not fully. My words of belief are shallow. They sound like they are words of a believer but how could they be anything useful? This Christ. This resurrection. Can words be at all fruitful if they are to point at something so beyond human understanding and beyond common participation in the world? How can I, a theologian by training, offer any words at all useful when the words themselves are limited and self-referential? It is here that I feel the failure of words even more powerfully. Words fall away on Good Friday. Yet have they returned on Easter Sunday? I am being called to re-visit my entire faith journey. To meet Christ again for the first time after the training (asceticism) of Lent, joining the crowd on Palm Sunday and the reordering of our imagination on Holy Thursday. After the waiting of Good Friday. And after the silence of Holy Saturday. I turn to the risen Christ. In fact, the importance of Holy Saturday has struck me over the years. It is the stillness and silence as a practice that actually allows for an encounter with Christ. It is how I return to Galilee. For without stillness and silence — resting in the unease of Saturday after the pain of Friday, I will not encounter Christ. I will only experience my own opinions and the Christ who is Lord will remain buried in the pious tomb I built for him with the stones of my own design. By letting go of my words and thoughts and my desires to have to do anything, I allow Christ to rise where I can go to encounter him in Galilee. So I can live a life that demonstrates trust in this risen Lord. So I can offer The Word who is hope and joy to those suffering, those on the margins and those in most need. 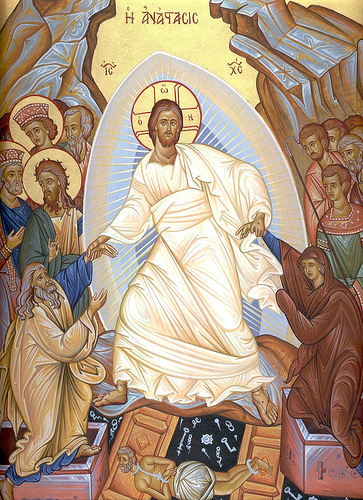 And so I can say with the Church — Christ is risen! Truly he is risen! — and the words will be filled with more than my opinions. In allowing my words to die — The Word of God rises and fills my lips and I re-read the world from this supreme act of love. Wonderful piece, Kevin. I once took a fresh theology course at BC called Resurrection: Myth or Reality, with John W. Howard, SJ, the basis for most everything I know about the gospels, and I remember Fr. Howard introducing me to At. Augustine’s wise words “Faith Seeking Understanding,” rather than its opposite. Fr. Howard would indeed enjoy reading your beautiful words! Hallelujah!